Search engine DuckDuckGo launched updated browser extensions and mobile applications for all major platforms today. The company notes that it has redesigned all products to include new features such as tracker blocking, smarter encryption and private search. The browser extensions work all the same. They are available for Firefox, Chrome and Safari officially, but can also be installed in compatible web browsers such as Opera or Vivaldi. Note: Installation of the add-on will change the web browser's default search engine to DuckDuckGo. Some browsers may display prompts about that while others may not. You may change the default search provider in the preferences however without loosing other functionality that the add-on provides. The DuckDuckGo browser extension and mobile app will also now show you a Privacy Grade rating (A-F) when you visit a website. This rating lets you see at a glance how protected you are, dig into the details to see who we caught trying to track you, and learn how we enhanced the underlying website's privacy measures. The Privacy Grade is scored automatically based on the prevalence of hidden tracker networks, encryption availability, and website privacy practices. 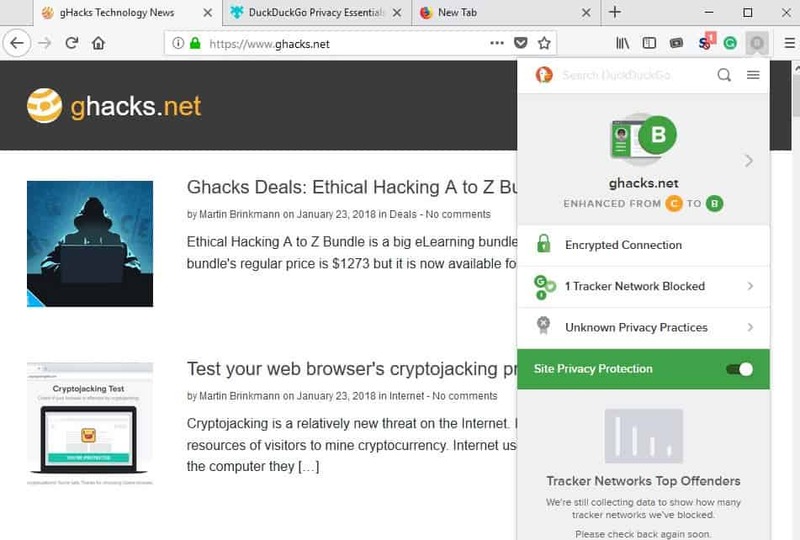 The browser extension, called DuckDuckGo Privacy Essentials, adds a single icon to the browser's main toolbar. The icon displays a privacy rating for any site you visit with A indicating optimal privacy and F less than optimal privacy. A click on the icon displays information and several options. You find a search bar at the top to run searches on DuckDuckGo. Encrypted Connection -- Determines whether the site uses HTTPS. Tracker Networks -- The number of tracker networks found on the site, and how many have been blocked. You can click on the arrow next to it to display them all. Privacy Practices -- Whether privacy practices have been analyzed by the third-party service TOS;dr. The extension blocks trackers automatically by default. This means that (some) ads may not be loaded as well when the DuckDuckGo extension is active in a browser. The extensions offer two additional options at the time of writing. You may enable that embedded tweets are shown, and may add sites to a whitelist. The mobile applications work pretty much in the same way. They are standalone however which means that you use the applications to search the Internet and to display websites. The applications display the same information when you activate the DuckDuckgo icon in the integrated browser. You get the site's privacy rating, and can find out about the use of trackers on the site as well. As is the case with mobile applications these days, the apps may not be yet available for all users. You find links to all supported browser extensions and mobile applications on the Spread Privacy website. Now You: Which search engine do you use predominantly and why? Very similar to Privacy Badger, which I have been using for the longest time. I’ve tried the Firefox version (‘DuckDuckGo Privacy Essentials’) by curiosity because uBlock Origin does it all, except for pointing out the connection’s encryption and a site’s “privacy rating”. A connection being encrypted is already obvious to notice on the browser. Privacy ratings, for what they’re worth, suffer once gain of the “insufficient contrast syndrome” : reading the rating is a pain, especially at night with a lowered luminosity/contrast monitor. Why not white on black or black on white? No idea, maybe the developer was hooked by artistic aims, but the result is that the rating is a challenge fr the eyes. I just cannot understand this design, known on several sites when it comes to their content, now available on icons as well. Good heavens. Agree on design. Seems they could simply use the color scheme they use inside the drop down menu – C=Yellow, B=Green, A=? Yeah, seems so obvious. Maybe do they design on 50″” monitor screens, no idea, but here on a 1600×900 the icon is tiny and its content hardly readable. It’s not the main thing but I mean : if they use the icon to illustrate the rating they might as well do it correctly. Forgot to mention this : the extension uses “Forced encryption” when applicable. On what basis? I disabled ‘HTTPS Everywhere” and DDG didn’t force encryption on several sites called by http but available as https. I’d be cautious relying on their “forced encryption” reliability. I just tested the extension right now as it has been updated since he first time I had tested it. OK, better than nothing perhaps but not comparable to what the best can do (uBlock origin and uMatrix). Better than nothing, ok. Thanks for the information. However, I can’t see why anyone would want to install this browser extension, even if this search engine is used frequently (assuming users have installed essential privacy and security browser extensions). Thanks for posting this so more people will get to know about it! I just found out about this add-on yesterday. @Martin – FYI…There is a > button at header RHS (large area where it identifies the website – in this case, in your image, ghacks.net), which provides additional (limited) information. The part I don’t understand is the Privacy Grade = C, Enhanced Grade = B.
I’m sure there is a link somewhere to explain this, but just a guess… when using uMatrix, googlesyndication and googletagservices are blocked on my browser (yep, no ads, I need to become a Patron) – perhaps that is driving the Enhanced Grade? The Grade Enchanced from D to C its when it block the trackers idk. So it make your privacy better? I use Qwant as my main browser. they don;t log one’s ip address etc.etc. Happy with the search results. have been using it for more than a year. Before that I used Startpage. Was happy with that one too. Qwant is indeed a very nice and complete search engine, including besides Web search, news ans social sites results. Side-note : the Firefox ‘Cookie Autodelete’ starting Firefox 58 now can delete a site’s data sent to the user’s localStorage alongside deleting its cookies. I mention this because Qwant becomes therefor a good testing platform for localStorage and ‘Cookie Autodelete’s ability to delete that localStorage data as well. Tested myself. @ wybo: Did you find Qwant’s results better than DDG? I’ve tried Qwant on various occasions but it was struggling to give me what I was looking for. Especially when you start searching in languages other than English, it struggles to come up with sensible search results… Wish it were better, though, as I like their design! Since this is a mobile app my question may not be relevant but I wonder if anyone encountered the same experience on their laptop today. I went grocery shopping this morning, came home and found my default browser went back to Google. After a bit of digging around I noticed DuckDuckGo browser was disabled on my laptop, I certainly didn’t disable it. So what could possibly have happened? Their update basically ruined their Android app. Prior this point, one could install it as a search bar widget in place of the Google one, and set it up to launch results in the browser of one’s choice, including Firefox. Now, there is no search widget and it only does things in it’s own browser. Basically, it morphed from a search app into being a browser. There was always a browser inside there, I guess, but I think most of people just disabled it and pointed it toward a more functional browser on that platform. I suppose uninstalling it saved me some harddrive space, though. I guess I’ll just have to open Firefox first and then search from now on. I miss the search widget (Firefox’s search widget is no good, takes as many clicks as just opening the browser would, so I open the browser), but looking on the bright side, uninstalling the new useless-for-my-purposes DDG app gives me some first screen space to experiment with other widgets on (Right now it’s a headline from favorite football team widget). Just because I use your search engine doesn’t mean I want to use your crappy tabless browser. Um what I do when searching in other languages is change Qwant to another language. So when I need to search in German I change the country option (click on the flag) to Germany. So I don’t have any problems searching in any other language. I hope I explained it well enough as I’m not a ‘techie’. @ wybo: Sorry if I wasn’t clear; I didn’t mean how to perform the actual search in other languages. What I’m trying to say is: Google has a massive reach across the internet, and they’ve been indexing and trawling websites in all languages for a very long time. Other search engines like DDG and Qwant (both of which are partly reliant on Bing) have got a smaller amount of indexed data in non-English languages, which – to me – makes them less useful for such searches. When I’m searching in non-English, the latter two engines give me fewer and less precise results compared to Google, although I must say that they’ve improved over the last year even in this respect. In that profile you’ll find webappstore.sqlite, but you cannot edit the file while Firefox is opened because the file is opened. If you wish to delete webappstore.sqlite, note its path, close Firefox, and go to the file with Windows Explorer. Why delete webappstore.sqlite? For the same reasons one may wish to delete cookies. If you have data you wish to keep (such as Qwant settings), this data will be deleted as well. webappstore.sqlite holds what is called the LocalStorage, in which some sites store users’ data. If deleted it is automatically rebuilt on Firefox start, empty and clean therefor. I dislike the fact a site may use the user’s LocalStorage rather than plain cookies to hold the user’s data, such as Qwant does it. It is IMO an inappropriate way of proceeding, essentially idiot because many users delete webappstore.sqlite as part of a cleaning process hence delete whatever cookie-like honest data (i.e. Qwant). I think many that are using DuckDuckGo already are familiar with privacy issues and are not using Google for a reason (because let’s face facts, !g is a far superior search engine). Thus, these people are already using uBlock or uMatrix or other privacy tools. I’ve been using DuckDuckGo for many years and would far prefer their dev time be spent refining search and introducing new innovative features (like !bangs etc). That used to be true, but the quality of the results coming from Google have been declining for a few years now (at least for me). These days, DDG gives every bit as good as — and sometimes better than — Google, for me. The one exception is doing an image search. Google is still tops for that. I agree with John Fenderson. Besides, Google results with an empty user’s history and cache is far less pertinent. Also, competitors often progress faster than the leader resulting in reduced margins (often, not always : you have to fight to be first, you have to strive to remain first). DuckDuckGo is quite nice, yet personally I use other search engines as well, mainly searX and Qwant. They all have their specifics of course, but DDG in terms of market share progress, related to its growing image within the public, is certainly on the rise. Now of course the big question is to be sure that logs are out of their game. I know they say so and I’m not cynical but nowadays I wouldn’t swear of anything (including the opposites). @ Tom: Question for you – how do you get Firefox to show autocomplete suggestions for Qwant and Searx? I’m only seeing autocomplete suggestions for built-in search engines, including DDG, but when I’m setting up these additional two I’m not getting anything. I have enabled autocomplete on their respective websites, though, and that works fine on the sites themselves. It’s quite annoying, actually… Any idea? I use the Mycroft Project to add Qwant and Searx in FF, by the way. @ShintoPlasm, I’m afraid I cannot answer that question. I never use search autocomplete, I disable it on the browser side and do as well on search engines’ options (those for which I keep the option cookies. There’s so much to deal with on a computer that my policy is to shake my legendary laziness only when absolutely required, shaking because I lack academic hence global knowledge in this area which would point to possible answers to your question in a logical checklist style approach when my own is only empirical. Maybe related to the get or post querying of the new search engines? I’d have to test myself. I keep your experience in mind in case I’d face the issue provided I’d use autocomplete. Sorry! So you have searX autocomplete resolved, what about Qwant? – Looks like adding search engines via the Search Bar’s green plus sign works for autocomplete, both for Qwant and Searx. – For Searx, adding it through the link in their FAQ section works too (as per above). – The Qwant/Searx extensions on AMO don’t seem to provide this functionality. – The entries on Mycroft don’t either. Points (3) and (4) have in common … Mozilla? Odd. I appreciate your experience, triggers curiosity. One would have to compare the search formats. The explanation is maybe simple. It’s obviously in the search format. I mentioned above the ‘^post’ and ‘get’ search formats, I wonder if that’s not the difference which makes one as opened to autocomplete and not the other. I’m putting my best investigators on the case, not cold yet. (tiny lol). @Tom. Yes FF and WF are the same I knew that :). Oh dear I have never used Win Explorer. So one cannot delete this file in FF/WF but only in Win Explorer. As you can imagine this is confusing to me. Sorry. If you would be so kind to explain it would be appreciated and I will learn something from it. The point is you don’t/cannot edit/delete running files. As for the Explorer, it’s that of Windows if your OS is Windows, but whatever file manager will do it (i.e. Total Commander). I understand what you’re saying. Well I guess I just do basic/regular non English searches with Qwant as I am happy with the results. Having said that I understand where you are coming from. The Big G is the best search engine for the widest info available but for obvious reasons I decline their services. I’m concerned that people may believe that they are being protected from things like the NSA and other surveillance organizations, simply because they are using DDG. However, that isn’t the case. There are many privacy vulnerabilities even with a private search engine.